Gone are the days when graffiti is seen as just some scribbles on a wall by disenfranchised youth; now painters like the infamous Banksy have given the craft a legitimate standing in the arts world. Street art is found all over the world and Dublin is no exception with some great samples to be found all over the city. From top-left clockwise: Fintan McGee & Maser (Sink or Swim), Conor Harrington (Black Herds of the Rain), El Mac, Maser (BP Fallon), Conor Harrington (Dead Meat). In the heart of Dublin's bohemian arts quarter, Temple Bar, Cork-born artist Conor Harrington's Black Herds of the Rain is the first stop on our wander through Dublin's outdoor gallery. Conor describes this colourful piece on his blog, “In his 1936 poem ‘The Lost Heifer’, Austin Clarke refers to the Irish struggle for Independence as being like a cow wandering in the rain. So for this set of pieces, I like the idea of the bull in all its wild and beastly glory representing the new Ireland.” The colourful depiction is hard to miss as you walk the cobbles of Sycamore Street, but knowing the message behind it makes it come even more alive. One of the city’s most famous and prolific street artists, Maser painted “his buddy” BP Fallon, a well-known Dublin personality, DJ, author and photographer on the side of popular bar and venue the Button Factory, also located in Temple Bar. Maser has been long established as one of Ireland's best street artists and even though he now lives in the US and has travelled the world painting — including a month long artist in residence slot in Sydney — he returns to Dublin from time to time to leave his mark. Maser doesn't restrict his art to the streets however and has been involved in many commercial projects including work for musicians such as Damien Dempsey and U2, as well as producing work on canvas that has seen his star rise in the contempary art world. 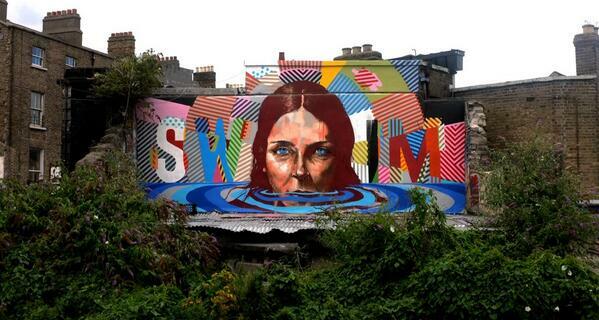 Australian artist Fintan McGee collaborated with the aforementioned Maser to create a bright and colourful piece showcasing both their distinctive styles, called ‘Sink or Swim’. With Fintan's thought provoking works donning buildings all over the globe, this is one artist that doesn't shy away from sending out a message. Having worked together before, Fintan and Maser know each other's style, and their easy working partnership resulted in this stunning mural. You’ll find it on the side of popular Dublin pub the Bernard Shaw — a great spot for pizza and pints! US artist El Mac is known for his evocative large-scale portraits, often depicting the Chicano and Mexican cultures he grew up around. He has also famously painted aerosol versions of classic art, leading to a commission from Groenige Museum in Brugge, Belgium. His style combines his love of the old European masters with graffiti, meaning his street art has become famous the world over earning him many major commissions. See his handiwork for yourself on Francis Street, part of Dublin’s exciting antique quarter, not far from the National College of Art and Design where his work can inspire Ireland's finest upcoming artists. So good, he’s in here twice! London-based Conor Harrington also painted this stunning, collage-style work where old-school graffiti meets fine art. Called "dead meat" the piece depicts an aristocrat, who could have stepped out of a Rembrandt or a Vermeer painting, with a dead deer at this feet, obscured and surrounded by his graffiti-style art. In his signature style, the painting looks like a Dutch masters’ work “destroyed” with graffiti. Similar works of Conor’s art have been popping up in many places including London and Paris. Check it out on Merrion Row, just around the corner from leafy St Stephen’s Green. James Earley recently painted a fantastic large-scale mural on City Quay. A vibrant piece, it depicts a proud Irish wolfhound, interspersed with iconic Dublin landmarks. Be sure to pay it a visit as you take a stroll Liffey-side and see James in action in in the video below or read more about James' background in art.